Jennifer Percy is a Pushcart Prize and NEA Grant winner whose work has appeared in Harper’s and The New Republic. A reporter explores small communities in the South where soldiers are delivered from their haunting demons of war. Jennifer Percy interviews Afghanistan veteran Caleb Daniels, who believes he's fighting a spiritual war against the demons of the war in Afghanistan. Woody Harrelson, as grizzled as he can get. …from which they dropped the Special Forces recon team down the woven nylon ropes deployed on either side, letting them slip to the ground quiet as raindrops down leafstalks. His eyeballs move beneath closed lids like things turning over in the womb. His story is a must-read for all of us. It’s vital to our understanding that the demons of war will not, whatever the treatment, retreat. 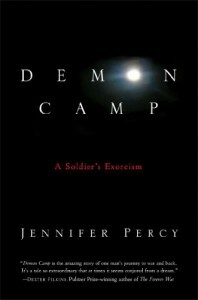 And ultimately, the book’s tag line “A Soldier’s Exorcism” is ironic (I’m not giving anything away because this isn’t that kind of book), because the main character, and anyone suffering from this kind of trauma, cannot in the end be completely exorcized. As Percy says, “Then I knew that God was just a word he used to talk about other things [...] George W. Bush borrowed the vocabulary of religion for his war. Now Caleb borrows the vocabulary of war for his religion.” Which is the crux of the book. This is not a "war-book" in the traditional sense. Not much of the book takes place anywhere but right here on American soil, after the war, where a new war is being fought against PTSD—what these characters believe to be Demons. But Percy walks a fine line between both of these interpretations, respectful yet critical, concerning herself less with the vocabulary used to describe the trauma and more with the trauma and its manifestations. “Physical pain is corporeal and so wounds feel like evidence… If the existence of pain is always, if possible, confirmed through the flesh, then the pain of the mind—psychic pain, tragic pain, the pain of broken hearts—must also desire such confirmation.” Ultimately, this book is a moving piece of literature, moving us to acknowledge the seeming inevitability of PTSD; there's a realization that, call it Demons or call it PTSD, this thing has been haunting us and will continue to haunt us as a nation, immune to its exorcism as long as we practice faith in war.